The flames from the Northpoint Training Center could still be seen Saturday morning. 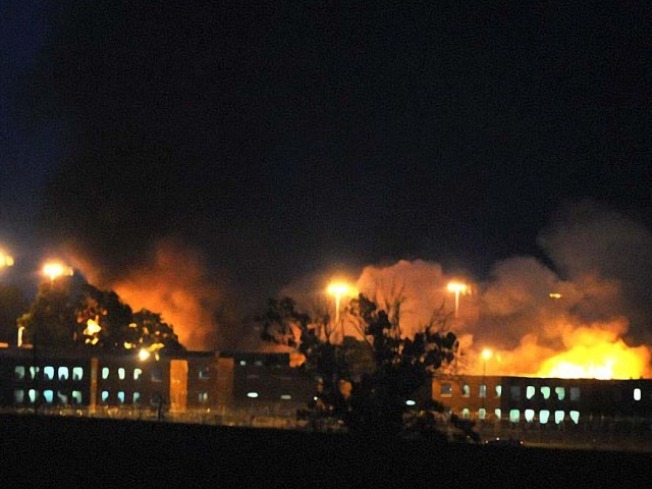 A group of rowdy prisoners at a Kentucky jail set their prison ablaze Friday and had to be subdued by dozens of officers toting tear gas and weapons until the melee stopped. Rioting inmates started lighting trash can fires and setting prison property on fire around 6:30 p.m. at the Northpoint Training Center south of Lexington, the Associated Press reported. The jail's medical building, kitchen and several other buildings were damaged in the massive blaze, which could be seen from miles away and still burned into early Saturday morning. Officers broke up the riots with tear gas at 9 p.m. and got all 1,200 inmates back in their dormitories by 10:30 p.m.